Notice: The above Section 8. 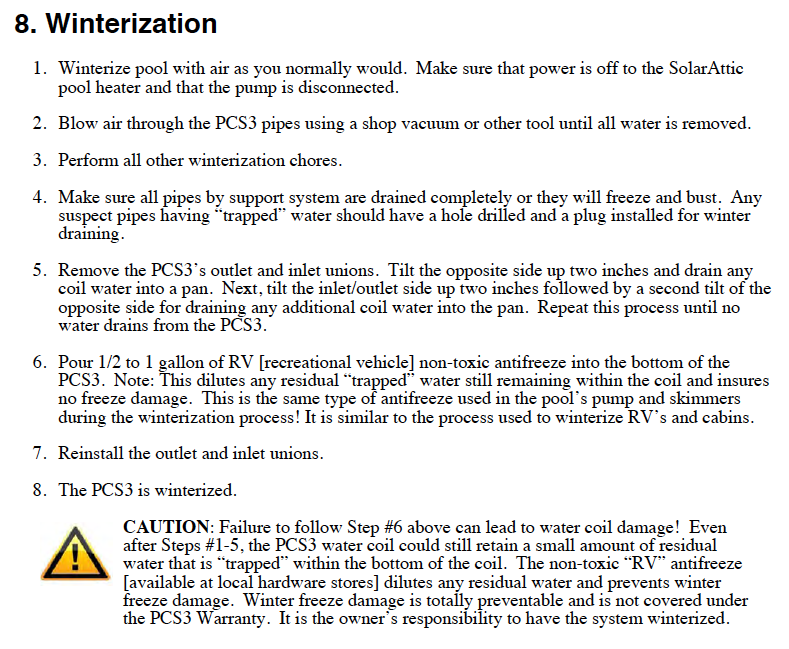 Winterization process is found on Page 18 of the Installation Manual. If you live in an area that requires you to winterize your pool, you will need to winterize the attic heat exchanger with the above process. Failure to do so, can result in damage to the water coil which is not covered under the warranty. It is the responsibility of the pool owner to properly winterize the attic heat exchanger. If you live in an area that does not hard freeze, but only occassionally threatens the pool with freezing, see the process on Page 19 of the Installation Manual. In this case, you will need to keep water running through the heat exchanger. Also, see Plumbing FAQs for further discussions. Own A Piece Of America's Energy Independence!